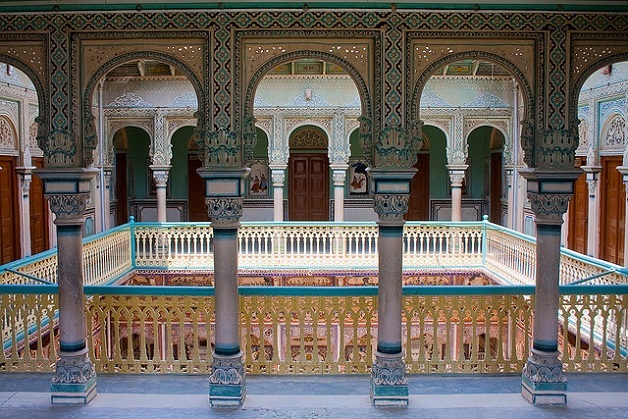 Anandi Lal Poddar Haveli is one of the Nawalgarh’s most beautiful and regal creations. Situated in the heart of the city this Haveli was constructed in 1902 by Ramnath Anandilal Poddar and since then has been famous as a bright tourist spot. Anandi Lal Poddar is believed to be a perfectionist so much so that in order to create the painting of a train he had sent his men to Bombay to have a look at the real train. Anandi Lal Poddar Haveli is enamored with exquisite paintings and fine murals set in bright blazoned colors. It can be a real treat for people who are true art and beauty lovers. 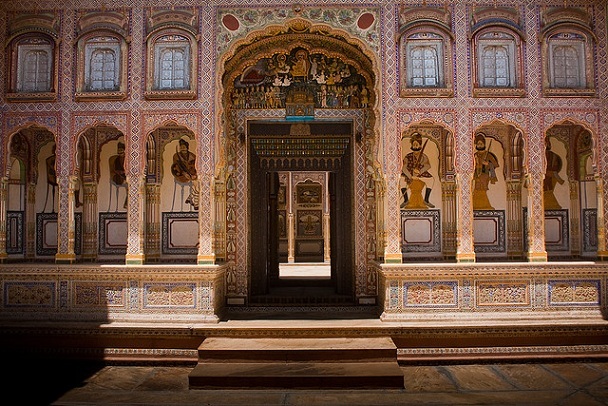 The paintings and murals on display are true reflection of the royal grandeur and legacy of Rajput era. The Haveli is not only captivated by the large frescos but even the miniature form of beautiful paintings is equally worthwhile sight. In short we can say that Anandi Lal Poddar Haveli is a rich storehouse of rare and splendid Rajasthani artwork. The array of beautiful murals and frescos depicts a variety of images of royal knights and kings men. Lord Krishna surrounded by gopis and cow herd can also be seen in some of these exquisite paintings. The frescos in Anandi Lal Poddar Haveli is not completely about the depiction of historical or new advancement, it also shows the fine structure of varied fittings of the royal buildings i.e. pillars, archways, doors and courtyard etc. One can find more than 750 frescos in Anandi Lal Poddar Haveli. The huge number of beautiful paintings displayed at one place has helped in winning the central position of being a major tourist spot for this Haveli. Intricate artwork, floral motifs and beautiful swirls are significant in all the frescos. The Haveli museum is a two story building which has a big platform outside the entrance gate. It has a beautifully wooden carved main gate, two big open courtyards with wide open lands surrounded by walls from all four sides. A Museum is build inside the Anandi Lal Poddar Haveli, which is another major attraction for the visitors here. This part of Haveli was converted into Museum by Mr. Kantikumar R.Poddar who is the grandson of Anandi Lal Poddar. It is divided in several sections displaying musical instrument, kitchen utensils, jewelery items, gems etc. Apart from these, the Museum also exhibits artifacts which reflect Rajput culture and traditions. It has big living rooms with huge windows for adequate light and air. The front portion of the Haveli measures to 110ft. x 25ft. which is surrounded by beautiful frescos. The top balcony is well designed with the help of pillars and arches. All the walls of the courtyard and baithaks are fully covered with beautiful paintings. The ceilings, gates and passages are specially decorated with rare and exquisite murals. The fresco designed gate between the outer and inner courtyard has been ranked amongst India’s top 10 gates. Anandi Lal Poddar Haveli is one of the rare and most beautiful constructions of Rajasthan. However the frescos have deteriorated considerably with the passage of time. The caretakers need to restore them in order to preserve what is exquisite and rare form of art of Rajput era.